This was meant to be posted a while ago, but it's part of a small collaboration with Itunu and I'm sharing a brief thought of what's been in my high school backpack and what I've learned to carry! There are probably a few things I'm forgetting, and a few things I'm leaving out because you already know to bring paper and pens, etc. I use a North Face backpack and it treated me SO WELL throughout high school. I had been worried at first because it only has one large pocket, as opposed to my old Jansport one that had two, but it's better this way and I live and breathe by my backpack. Especially in hectic years and days, I carried it more than my purse. Also, being able to carry my computer in my backpack is a great feeling too, and North Face has great padding that doesn't make it feel as bad. I've only included a few essentials but decided I would go through them. I used to carry a purse along with my backpack, but junior year decided that it was too much and only carried my backpack. I could easily leave things I didn't need in my car or my locker. Planner: DUH. I went with small so I could keep it in my front pocket and have it at all times. Little notebook: I always found myself writing out thoughts and lists and was using too much loose leaf paper for pidly little things, so I found this cute little notebook at Walmart and love it! Reading book: You will never find me without a book I'm reading with me, and especially at school! It's easier to be out now and just use my phone to kill time, but when you're in high school, you can't always do that, and I found those times to be the best for catching up on your book! Scissors: I became known as the girl who had everything, and for some reason, no teacher ever has scissors, but I did. Tape: SAME exact thing goes for the tape. I used it way more than I thought. Painkiller: I probably shouldn't have this on my list because it's probably against your school rules. But I posted it anyways, so do what you want with it. Gum: Lots of it, but HIDE IT. Gum in your backpack is like a drug that everyone wants a little bit of, so you've gotta keep it hidden so you don't run out in a day. Cures bad breath and hunger before lunch. Ponytail holders: I need a ponytail holder every single day and the worst feeling is not having any. Small hairbrush: I hate the feeling of tangled or weird hair and even though it feels somewhat high maintenance, I loved carrying around that little brush (travel aisle!) for when I needed it. Small cosmetic bag: You still cannot catch me without my catch-all of lipgloss, small mascara, lotion, etc. The bags changed, but the things in it stayed the same! Anything you use, but in the travel size. Keys and wristlet: Keeping my keys in my backpack makes me feel much better than in my purse or pocket or anything. And I learned the very hard way that you should not EVER put your phone in the mesh pocket on the side because it can be stolen in 30 seconds without your knowledge at all. 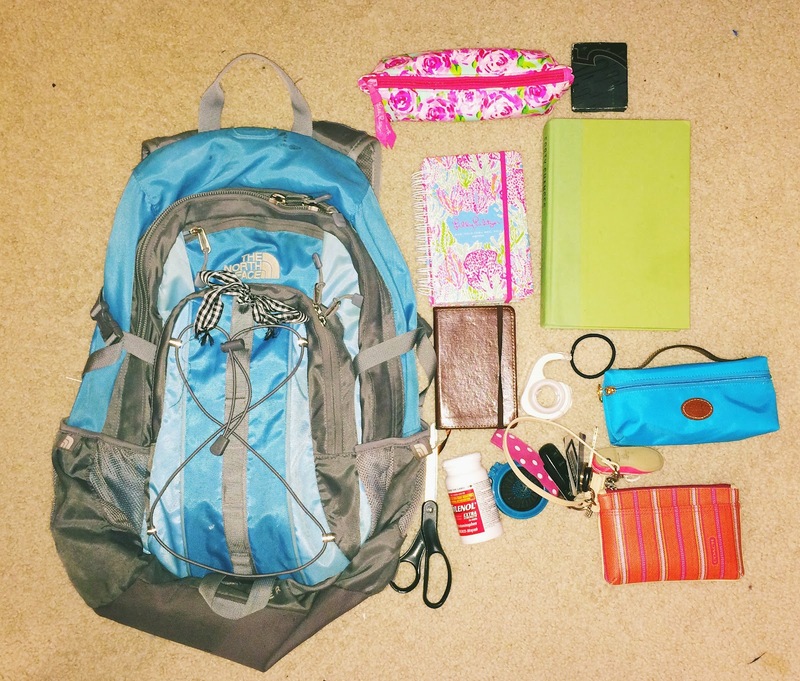 Just don't put it there- hold onto it or zip it up in your backpack. Pencil pouch: I hate it when pencils roll around in the bottom of your bag and you can't find them! Get a cute pouch and stay organized all cute, it'll make you feel great! Also- I move in today! Long trip yesterday, but I'm excited for seeing how my dorm turns out! I love your must haves! I'm a senior in college and I still use a majority of these same things in my backpack since I'm on campus, rushing around for most of the day. Thanks for such a great list! Where did you get the blue cosmetic bag? I'm looking for a nylon bag like that to use for a pencil case and that one looks like good quality.